During National Women's Health Week, and every week, it's never too late to take control of your wellness and be the healthiest you. Just remember, there are women across the country who are doing the same, and who support you. Just a few days ago, people all over the country gathered to celebrate the person around whom their family dynamic often revolves. I'm talking, of course, about mothers. In general, moms are wired to be caregivers. They look after their children, their spouse and more -- maybe their parents or siblings, perhaps a neighbor or a friend across town. Notice anyone missing from that list? Such as, Mom herself. Far too many women focus on the health and happiness of others without taking the time to care for themselves. While there's a sweet, loving motive behind this kind of priority structure, it also comes with a fundamental flaw: If these women get sick, those who depend on them will be left in need. Like everyone else, women should maintain a healthy diet and remain active. When they don't feel well, they should see a doctor. And then there's this: They should also see a doctor once a year to stave off problems before they start. You never know what might be lurking. While many people consider heart disease a "man's problem," the fact is that heart disease is the No. 1 killer of women, claiming more lives each year than all forms of cancer combined. This week is National Women's Health Week, an effort from the Office on Women's Health from the U.S. Department of Health and Human Services. The focus of this year's National Women's Health Week is leading a healthier life at any age. 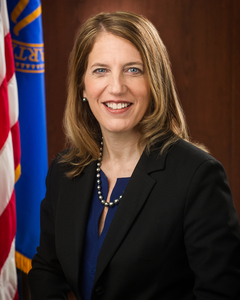 To continue this important conversation, it's my privilege to turn this spot over to HHS Secretary Sylvia M. Burwell. One of the best parts of my job is getting to meet women from across the country. Together, we talk about our lives, our families and our communities. And we often talk about health care. Women continue to be the support beams of our families and our communities. We often make the health care decisions for our families, but we seldom make time for ourselves. That's a mistake for our own health, and the health of our nation. We can't support others if we aren't taking care of ourselves. At HHS, we want to empower all women to take control of their health. That is a key goal of the Affordable Care Act, which expands access to affordable, quality health coverage and provides new protections to millions of women. Since the ACA has taken effect, about 9.5 million women have gained health coverage. But it's not enough to just have a card that says you're covered -- you also need to use that coverage to get and stay healthy. During National Women's Health Week, May 8-14, we want all women to take that first step by scheduling a well-woman visit with their health care provider. The annual well-woman visit is a great opportunity to discuss your medical history, health concerns and what preventive services and screenings you might need. And thanks to the Affordable Care Act, this well-woman visit and other recommended preventive services are covered at no out-of-pocket cost. At HHS, we hear from the women whose lives have been impacted by this progress every day. Joelisa Castillo from Milwaukee, for example, got covered through the Marketplace so she could manage several chronic conditions and get regular checkups and screenings. These screenings were especially important because her family history includes diabetes, breast cancer and cardiovascular issues. Aurora Harris from Houston didn't get her well-woman checkup for several years because she couldn't afford health insurance. But thanks to the ACA, she bought coverage, and used it to get nutrition and weight counseling. Today, Aurora helps LGBT women take control of their health, by encouraging them to get routine screenings that can help detect cancers early and connect them to effective treatment. If you can't afford insurance, check out a community health center near you to see a doctor or a nurse. The center will charge you only what you can afford based on your income. When you get your well-woman visit, don't be shy. Talk to your health care provider about your eating and exercise habits, and be open about your reproductive health. What a well-woman visit should include will be different for each of us. So discuss your medical history and your age, and decide with your physician which preventive services are right for you. These could be services like breastfeeding support, contraception, or screenings for blood pressure, cholesterol, depression, breast and cervical cancers, and alcohol misuse.